"I don't know what to write about!" How often do you hear this in your classroom? It is usually accompanied by a groan or a sigh, and a feeling of hopelessness and despair. You want to feel frustrated with this student's lack of motivation and total lack of creative thought. But....you know exactly how they feel. It is HARD to think of a writing topic, particularly personal narrative topics. Nothing seems good enough. "Nothing interesting ever happens to me," they think to themselves. To make matters worse, many of your students who are writing like crazy are writing nothing more than diary entries for their very, long trip to Florida. And then.....and then.....and then......Ugh! When I am feeling stuck as a writing teacher and my students seem to be going nowhere with their writing progress, the first place that I turn is to my mentors. Patricia Polacco, Donald Cruz, Jacqueline Woodson to the rescue! When you pull out your students' favorite books...all of a sudden they are full of great ideas! When you read a great book with your students, have them discuss the CONNECTIONS they have with the book. What does it remind of them of? Has anything like that ever happened to them? What were the characters feeling and have they ever felt the same way? All of these questions will help to grease the wheels and get your students writing in no time! 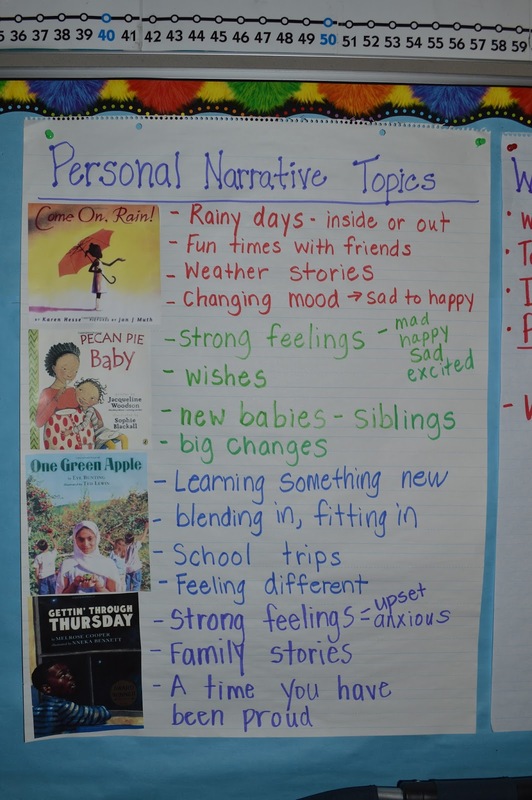 It is a great idea to create topic charts with your students as you read classroom favorites. A three-column chart works great. In column one list the book title/author, in column two list the theme or author's message (we call it the HEART of the story), and in column three list student writing ideas and connections. Display this chart throughout your narrative writing unit so that students can refer to it when they get writer's block. Students begin to realize that a story can come from a lot of different places and the best ideas come from our every day lives and those especially those events that give us strong feelings. One of the most difficult hurdles in teaching students to write good narratives is getting them to write SMALL MOMENT stories (Calkins). I tell my students that a small moment story is an event that lasts only a short time...only minutes or hours...NOT DAYS. That way the story can focus on the details (thoughts and feelings) rather than on telling only what happened (and then, and then, and then). You take a small moment and make it BIG with all of the juicy details. This is much easier said than done with third graders!! But it is worth spending time on with your students. You must INSIST that their stories are small moments by meeting with each one of your students before they settle on a story idea that they will be revising, editing and publishing. There is nothing worse than finding out one of your students has been spending days and days (even weeks) on a "Florida" story. If you invest this time at the beginning of your unit, making sure that your students have chosen good small moment topics, it will make things much easier as you continue with trying to teach them how to add good details. Have students make a list of the important people and places in their lives. Then have them list events, or moments that they've spent with those people or in those places. This is a great place for students to try out REHEARSAL. As they come up with small moment ideas, they can "try them on" to see if they fit by TELLING the story to a trusted peer or to you. If they find they have a lot to tell about that event, it is a good fit. If they find themselves kind of stuck, then its probably not a good topic after all. For many students, a PEOPLE/PLACES chart is all they need to get started on finding the perfect topic. For others...they may need more pre-writing. As a third grade teacher, the idea of drawing during writer's workshop makes me cringe. However, it is a step that is necessary for some of my students. Some students, even in third grade, still need to get their writing juices flowing by drawing for a bit. We like to call it "quick sketching" in my class to avoid spending our precious writing time on elaborate works of art. These students use their People/Places chart to choose an idea and then sketch it out. You may need to sit with them and encourage them to add important details to the sketch. Then they can later refer to the drawing when adding details to their story. Drawing can be just the warm-up that your more hesitant writers need to get them going. So let them!! I love webbing. Sometimes when I am at a meeting or a PD event, I will create a web of the ideas being presented instead of just jotting notes. There is a reason that a web is the most popular graphic organizer out there! 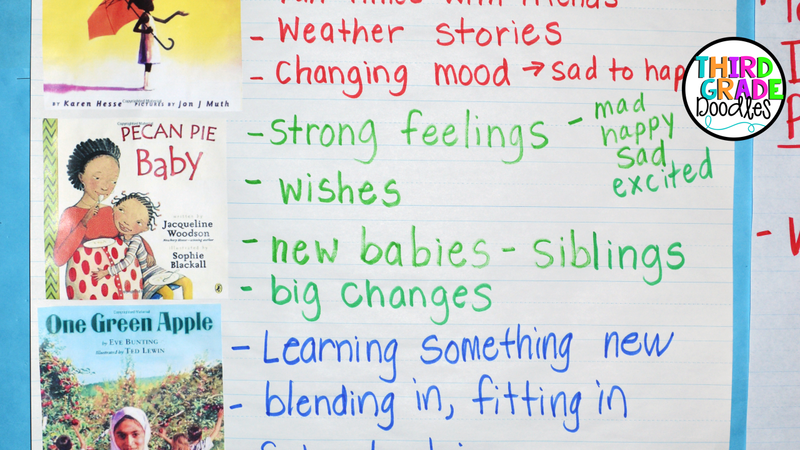 The human brain desperately wants to connect ideas, and it can be a great strategy for helping students to "find" a great narrative writing topic. Have them pull a general idea from either their People/Places chart, or from a class topic chart. It could be a feeling (excited) or a general idea like "fun with my pet". They jot that idea in the center of their paper and then begin drawing lines out from that central idea to brainstorm small moments that connect. Before you know it, they have an awesome selection of ideas to get them started! Kids love photographs and a picture IS worth a thousand words! At the beginning of the year, have students bring in photos of their loved ones and of themselves. They can glue these in their writer's notebooks or in a file folder and laminate. Students can then use these photos to help them generate story ideas. "This is me at my first soccer game.....oh! I could write about how I scored a goal at that game!" or...."Here is a picture of me at my aunt's wedding.....I sang a song at the reception!....I am going to write about how nervous I was!" Students have an open invitation to add photos to this collection throughout the school year....giving them an endless supply of writing topics! You could even have a "Friends and Family" photo wall in your classroom that all students could use to generate ideas! A memory string is an idea that I read about in Mentor Texts by Lynne Dorfman and Rose Cappelli. In this pre-writing activity, students select a word or an idea and write it at the top of their paper. These words could come from anywhere....a poem or story that you've read, a sensory walk outside, the weather (snow), etc. They then create a "string" of ideas that come from that one word. Snowball fights with my friend Paula. Building a snowman with my sister. Hot chocolate with my kids. Spraining my ankle tubing up north. The idea is that one memory leads to another, which can result in a long string of ideas. It is interesting to watch how the beginning of the chain can lead to a very different place toward the end (i.e., hot chocolate reminds me of grandma....which reminds me of when she died and how sad I was). It is similar to webbing, but can be a richer and more meaningful experience for students when we speak of their "memories." There is a great post about memory strings on Read-Write-Teach. This is an idea I love from Georgia Heard's book The Revision Toolbox. 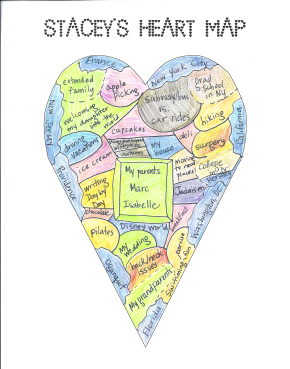 This activity helps students to find "the heart" of their story. They draw a large heart on their paper and choose a topic from their topic list (it could also be a topic they've already started on and have lost their way). They think about their small moment and inside of the heart they write all of their feelings and thoughts related to the topic. Students quickly get to the real meaning behind their story....the REAL story! They can then build up that part of their narrative with details including these thoughts and feelings, taking a good story and making it GREAT! This would be a great activity to try after students have picked an idea and have even started writing. It is also a great revision strategy. It would probably work best with older students, but that doesn't mean I am not going to use it with my third graders!! Here is a great one I found on the Two Writing Teacher's blog. They also have some great ideas for generating topics with your students. Our young writers have so many stories to tell! As teachers, it is our job to help them to discover those stories, even the ones that are buried deep within their small hearts! The best way to do that is to have a classroom culture that welcomes risk-taking and allows students to share their thoughts and feelings, knowing that their teacher and their classmates will celebrate the small moments of their lives. Thank you for visiting today. 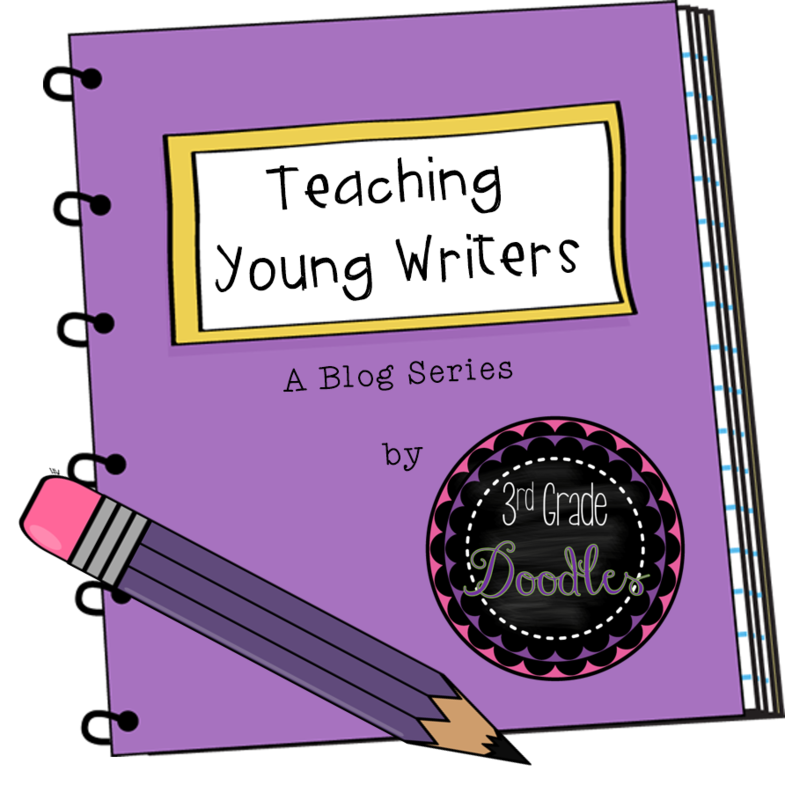 I hope I've sparked some ideas to help both you and your students to discover your own small moments to write about! Please feel free to comment below with some of your own great ideas for topic generation. 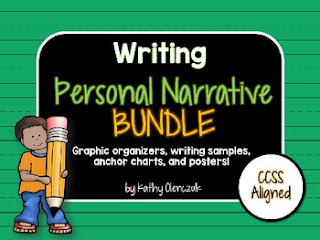 This bundle contains a set of illustrated topic ideas posters! This is the second post in a series about teaching young writers. My next post will be about "Flash Drafting" and how it fits in with the writing process. I hope you come back to check it out!